Alpha Waves is an early 3D game that is combines labyrinthine exploration with platform gameplay. By most definitions of the genre it could be considered to be the first 3D platform game, released in 1990, 6 years before Super Mario 64. Alpha Waves was released one year before Hovertank 3D, which is sometimes incorrectly credited as being the first 3D game on the PC. It provided the first truly immersive 3D experience, combining for the first time full-screen, six-axis, flat-shaded 3D with 3D object interaction (like bouncing on a platform). 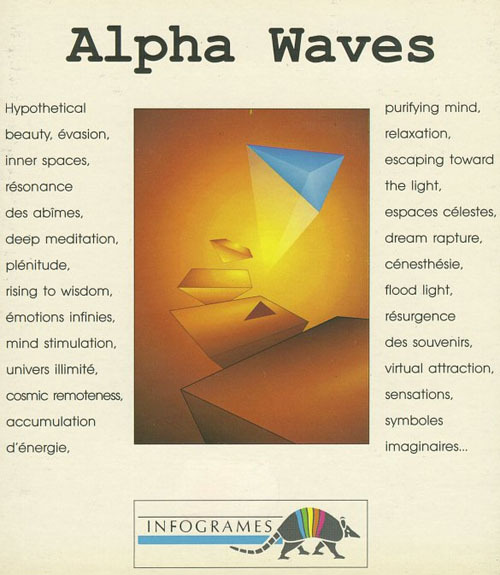 Alpha Waves was an abstract game with a moody, artistic presentation, curiously named for its supposed ability to stimulate the different emotional centers of the brain with its use of color and music. It was developed initially for the Atari ST by Christophe de Dinechin, and later ported to the Amiga and DOS. The DOS port was done by FrÃ©dÃ©rick Raynal, a notable game designer who would go on to develop Alone in the Dark (often abbreviated AitD), and Little Big Adventure. He has said that his work on Alpha Waves was a major inspiration for the 3D engine for Alone in the Dark. The PC version was also localized in North America by Data East, and retitled Continuum. Infogrames may have also published their own version in the US under the original title, and it was also released as a part of no less than two Infogrames compilations, on which it retained its original name.